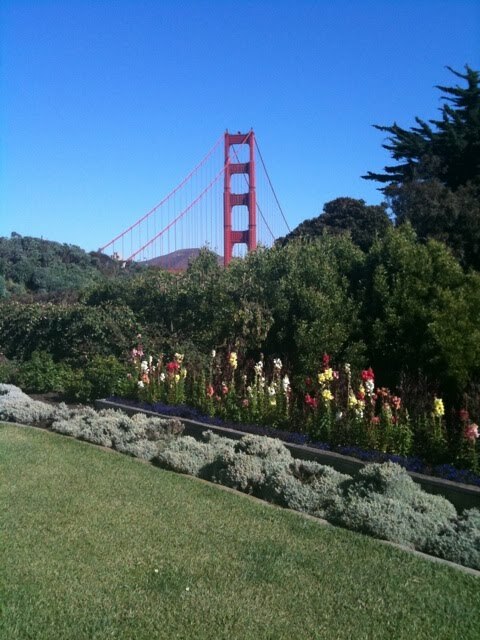 Then I Got To Thinking...: San Francisco... I've missed you! TL and I took a mini vacation (2 days) over to my favorite city in the world... San Francisco. Because we haven't been in a couple months, I was so excited to get there. The city gives me chills... the culture, the architecture, it's just gorgeous. Not to mention, I have some fabulous memories there. Because we haven't been in a while, we decided to go back to some of our own stomping grounds.. the Golden Gate Bridge (we felt like tourists) and hit up a few new restaurants! We loved walking across it... the city looks so beautiful from there. I love it! The weather was stunning... hotter than I ever remember it while I lived there! It was 93 degrees... even near the coast. Beautiful! It's so pretty... I loved it! We met up with my cousin and one of my favorite people in the world, Greyson. I love seeing him and catching up. He lives in SF and I absolutely adore him. We also met one of his friends, Jill, and went out for an early dinner and drinks. Greyson, TL, and I also went to Beach Chalet, near the ocean, for lunch. We sat out in the sun with a chilly drink and caught up. Loved it! We tried a few new restaurants. Palmino - near the bay bridge. All day happy hour - and delicious! We also ate at "The Grove" - a little expensive, but super yummy. Goodness, I LOVE that city! This week, TL & I were also featured on an amazing wedding blog! Awwww I love hearing about how much other people love San Francisco. I've never been to Palomino but it's fancy-pants! I drive by it all the time. There are so many good restaurants here, you could eat somewhere new for a dang year! What a fun trip! Lovely pictures; they are like postcards! Looks like an amazing time! My best friend is actually moving to San Francisco today, I can't help but be a little jealous! That's a place I've always wanted to get to! Looks like an awesome mini vaca! Love all the pictures. Congrats on your wedding being featured!!! I will have to check it out! I love SF and am so ready to get back there! And that wedding blog feature was great! You look so pretty! I am STILL hoping to make it to SF someday soon! I really want to visit the city and spend some time in Napa! Love SF!! I wish I could have made it there when the weather was so hot. I love SF, but the fog kills me when it is nice in the East Bay. We went last night and the fog rolled in and it got really chilly! It's my favorite city too - my engagement city!!! I just wish I lived as close as you do to it! Thanks for listing the new restaurants you went to! Next time I am there, I will try them! I will probably also get in touch with you on other places to eat! Food is my #1 priority when traveling! :) Hope you're having a great week! I can't believe how hot it was when you were there. :) Beautiful pictures. What a fantastic vacation Tracy ~ sounds like you had a blast. This is one of the cities that I would love to visit ~ maybe someday... Have a great week-end! you came on such a great day! such nice weather! !